Washington Postcolumnist Dana Milbank takes a fair and balanced look at the unsettling rise of the silly Fox News host Glenn Beck. Thomas Jefferson famously wrote that “the tree of Liberty must be refreshed from time to time with the blood of patriots and tyrants. It is its natural manure.” In America in 2010, Glenn Beck provides the very refreshment Jefferson had in mind: Whether he’s the patriot or the tyrant, he’s definitely full of manure. The wildly popular Fox News host with three million daily viewers perfectly captures the vitriol of our time and the fact-free state of our political culture. The secret to his success is his willingness to traffic in the fringe conspiracies and Internet hearsay that others wouldn’t touch with a ten-foot pole: death panels, government health insurance for dogs, FEMA concen tration camps, an Obama security force like Hitler’s SS. But Beck, who is, according to a recent Gallup poll, admired by more Americans than the Pope, has nothing in his background that identifies him as an ideologue, giving rise to the speculation that his right-wing shtick is just that—the act of a brilliant showman, known for both his over-the-top daily out rages and for weeping on the air. Milbank describes, with lacerating wit, just how the former shock jock without a college degree has managed to become the most recognizable leader of antigovernment conservatives and exposes him as the guy who is single-handedly giving patri otism a bad name. This is the interview with Kurtz which was copied from a Crooks and Liars story. KURTZ: He has a huge number of fans, as we saw at that Lincoln Memorial rally. He seems to tick off the left on a daily basis. But no one can deny that Glenn Beck is something of a cultural phenomenon and a lightning rod. GLENN BECK, FOX NEWS:We have the most radicalized president this nation has ever seen. I'm sorry. I just love my country and I fear for it. Thomas Jefferson said yes -- yes. But if they lose freedom -- he's speaking of us -- future generations, if they lose freedom, there will be rivers of blood. Boy, I hope that's not true, but I can tell you there will be rivers of blood if we don't have values and principles. KURTZ: Beck is also the subject of a new book, "Tears of a Clown," by Dana Milbank. And you really take a hatchet to Beck in this book. Is there anything you like about the guy? MILBANK: I think there's many things to respect about the man. He is -- love him or hate him, he is a brilliant entertainer. I think he is one of the great opportunists in our culture. He sees where things are going. He reinvents himself to get out in front of that and lead the parade. KURTZ: Now, Beck says in a "New York Times" magazine piece that happens to be out today that he is a recovering dirtbag. Everyone knows he's a former alcoholic -- there he is. He found God. He became a Mormon. He developed this message. You're saying or suggesting that he's a charlatan and he doesn't believe some of what he says? MILBANK: Look, I don't think anybody can get in his head and know how deeply he holds true the things he says, ,but we do have certain facts. We know that a dozen years ago, he was pro-choice, pro-abortion rights, and wearing a ponytail. We know that when George W. Bush was president, he came out in favor of the TARP bailout for banks. And then -- and now rails against it. So we do know that he's changed his views at convenient times. Very difficult to know what he actually believes of what comes out of his mouth. KURTZ: Beck says a lot of inflammatory things. That's part of his style. You see him as peddling conspiracy theories and talking about Nazis a lot. KURTZ: Yes. I think over his first 18 months, "Nazis" came up in his show 200 times, "fascists" another 200 times. Poor Goebbels only got two dozen mentions. But that's a constant them, but it's also the floating of the fringe conspiracies. Even Bill O'Reilly has said he believes that Beck is successful because he's willing to take it about five steps further than O'Reilly is. And that is by going on "Fox & Friends" and saying, "I can't debunk the idea that our federal government, through FEMA, is operating concentration camps in Wyoming." KURTZ: But he didn't endorse that, but you're saying he raised it. 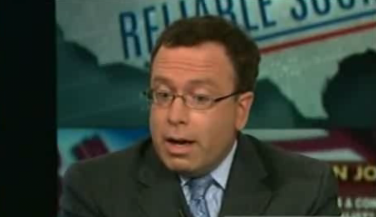 MILBANK: He said, "I can't disprove it." Then a month later, he gets on the show and said, oh, actually, it turns out those were doctored photos from a North Korean prison. MILBANK: He corrected it a month later, after a rather violent incident related to that. KURTZ: OK. Well, you talk about going too far, and maybe this is related to this. There was a 2009 murder in Pittsburgh, and allegedly committed by a guy who believes that the New World Order and government are plotting against our citizens. You say in the book, "It goes a bit too far to blame Glenn Beck for this, but Beck's words are inspiring the fringe." Now, isn't that guilt by association? MILBANK: Well, except that the people who are committing these acts often mentioned Glenn Beck themselves. We had another case of a guy shooting at the cops out in San Francisco, attempted to blow up the Tides Foundation, which was mentioned on Beck's show. MILBANK: That's why I say it goes too far to hold him responsible for that. But when you have a guy who's taking, as the Anti-Defamation League says, these fringe conspiracy theories and giving them an audience of, I don't know, 10 million people a week on the radio, nearly three million a night on Fox News, you're elevating something that has always been on the fringe in American politics and putting it front and center. So while you can't be blamed for any individual act, it is evidence that he is disseminating a very dangerous doctrine. KURTZ: You think he's dangerous? MILBANK: Well, I think it's been manifestly true that he's dangerous, but he's very powerful as well. KURTZ: You haven't proven that he's dangerous. You've proven that -- you've argued that he says a lot of things that you don't like. MILBANK: Well, and when a man is frequently talking about Hitler and Nazis, and then you see the Tea Party rally with the same quotations of Tea Parties and Nazis, the one-world government, the United Nations taking over civilization, posters of Dachau, you have to say, where does all this come from and why is it suddenly out in the open? So, yes, that's why I think it's dangerous. KURTZ: So you mentioned his big audience. I mean, he gets a huge number in the afternoon on Fox, radio audience. So what makes him so popular? What do you make of the people who tune in for inspiration? MILBANK: I think it is just that. I mean, in a country of 310 million people, two million watching him is not a huge number. But it's a huge number -- a small number of very passionate followers. Now, I mean, I think some of this is he very cleverly speaks to -- he's a Mormon, very cleverly speaks in terms of Mormon prophesy and conspiracy theories. I think that generates some of his audience. And some of it is also out of fear. He talks about the world is ending. People advertise for vegetable seeds on his show so you can keep it in a locked box, and when the apocalypse comes, you can plant it and grow vegetables in your back yard. He's pushing gold coins. So, his audience is very frightened people who really think the end is coming. KURTZ: All right. I'll tune in to see whether he talks about Dana Milbank on his show this week. KURTZ: Dana, thanks very much for joining us. Requests for an interview with Milbank have gone unanswered to date. Milbank wouldn't have a book if it weren't for Beck. If I turn this blog into a book, you could say that about me. You don't seem to have a clue as to whom Milbank is. He writes books. You know Victor, I am SO glad that you, Angelo, MM & others are REALLY getting this information out there. While I can't trust myself to write an eloquent expose of Beck at this time; I'm hoping to someday get my writing "mojo" back up so that I can also help expose Beck-or any other lying, egotistical bag of greed that crawls out from the shadows. I've told you before; I've been trying to tell people about this dangerous psychopath for 2 years. Living in an area where Beck is seen almost as a god, or the "people's savior", I've seen first hand the closed-minded, alternate reality that Beck has created. I've tried desperately to enlighten locals, whom I always felt were educated, well-intentioned people who for some reason had dove into this web of lies-and honestly believe that Beck would not lie to them. I've worked in psychiatric hospitals, emergency rooms and counseling centers, but have NEVER seen ANYTHING like this before. I've received at LEAST 7-8 death threats over the past 2 years for speaking out against Beck & trying to expose his lies. Lately though, as I've also told you, I've been getting "Thank You" messages & was even taken into the "back office" by 2 of my dialysis nurses, who had been such die-hard Beck fans, they tried to ban me from their clinic, telling the Company Mgt. that they just couldn't "work with a dangerous, radical Marxist". All because I didn't want to watch Beck everyday on a 50-something inch flat screen just 3ft in front of my chair-with the volume maxed out. They sat down & spoke to them last week and they told me that not only had they checked out your site, MMFA & Angelo's; but they'd gone to DC together for their vacation several weeks ago & spent time in the National Archives as well as other historical museums. Lo and behold; things weren't matching up & the more lies they found, the more motivated to check even more of Beck's stories. Long story short, they say they are "embarrassed" that they were so gullible. They've returned to their church, one decided not to homeschool her son after all,...it amazed me & actually brought ME to tears. They say they will still watch some Fox, but have started watching CNN & MSNBC, along with network news. They WON'T go so far as to watching Rachel, but, hey, you never know what the future holds! !